The U.S. Environmental Protection Agency (EPA) is seeking comments on a recently released draft technical document titled "Identifying and Protecting Healthy Watersheds: Concepts, Assessments, and Management Approaches." This draft technical document provides the basis for implementing the Agency's Healthy Watersheds Initiative, which, in partnership with states, tribes, local governments, nongovernmental organizations and others, is intended to protect the nation's remaining healthy watersheds, prevent them from becoming impaired, and accelerate restoration successes. The Healthy Watersheds approach, as part of the initiative, is based on a holistic, integrated, systems view of aquatic ecosystems that acknowledges their dynamics and interconnectivity in the landscape. 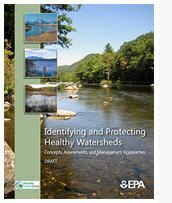 The draft technical document includes an overview of the key concepts behind the Healthy Watersheds approach, examples of assessments of healthy watershed components, an integrated assessment framework for identifying healthy watersheds, examples of management approaches, sources of national data and key assessment tools. It contains numerous examples and case studies from across the country. The intended audience and potential beneficiaries of this document include aquatic resource scientists and managers at the state, tribal, regional and local levels, non-governmental organizations and federal agencies. Local government land use managers and planners may also benefit as they develop protection priorities. EPA is seeking comments on this draft document until June 3, 2011.